Academy Award-winning documentarian Ruby Yang takes her audience into the lives of Tibetan monks, living on the edge of the world in some of the harshest conditions. With few recreational opportunities available, the nomadic people of Tibet decide to play basketball, based on their love of the game from watching NBA games on TV when taking a break from their traditional work of herding yaks. 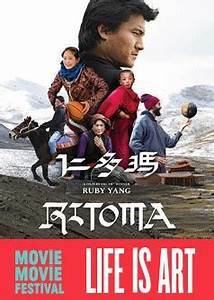 The film follows several Tibetans who have a life on the other side of the world, away from almost all civilization, but have a deep love for basketball. They have no real skill to speak of, or any sense of strategy. Enter a former college basketball coach and player who had lived a nomadic life of his own, living in several different countries teaching the game he loves. While he recognizes his players might not have the skill set or size he normally works with, what they do have is extreme athleticism and hard work. The culmination of the film is a basketball tournament in which several different tribes come together with their separate teams in a celebration of their nomadic cultures and their love of their favorite western sport. A special MIT alumni team from the United States has also come to not only play, but to learn about the Tibetan culture. The traditionally nomadic families now have a chance to learn and meet those from western culture beyond basketball. While the film draws you in with basketball the real heart of the story is the nomadic Tibetan culture and how it is eventually dying. It is dying due to the harsh nature of the job, the financial struggles and the recent introduction of a textile factory founded by Tibetan social entrepreneurs. The textile factory has also given Tibetan women a renewed sense of purpose in this culture which predominately had a stigma of being a home maker and child bearers. Indeed Tibetan women have now begun learning and playing the game of basketball as well. Although modernization could alleviate poverty is it worth sacrificing their original culture? This question is left for the audience to ponder. Ritoma has played several film festivals and had several special screenings all over the world. More information on the film can be found at: http://ritomamovie.com.